As a therapist, I am often told stories about people who have experienced wrongdoing from someone else. Often time, this person is usually a family member or someone who was a close and trusted companion. So, the person tells this story about what was done to them, and then how they themselves took the initiative to resume and repair the relationship.The story usually concludes with how the person was wronged again. These stories are usually told as one of the reasons for anxiety. The problem with these stories is that forgiveness should have nothing to do with whether you decide to resume a relationship with someone who has wronged you or not. Forgiveness is the process of letting go of hurt and pain. Further, forgiveness is also about focusing your thoughts on healthier people, places and things you find happiness in. In short, picking up where you left off and moving on with your life. When I tell people what forgiveness means, it is common to encounter significant defensiveness. “That’s just how I was raised!” These are two of the number of comebacks I encounter, after the forgiveness talk. As a Christian, I never bought into turning the other cheek, and I never will. If someone slaps you and you turn the other cheek, it is reasonable to believe that they will likely slap you on the other cheek. You want to protect yourself, not expose yourself to more harm or wrongdoing than what you have already experienced. So how do you practice real forgiveness? There are two stages of forgiving, acceptance and visualization. It is important to note that there is a lot involved in these two steps. For example, acceptance comes from the last stage of the five-stage grieving process, while visualization is a four-stage process. 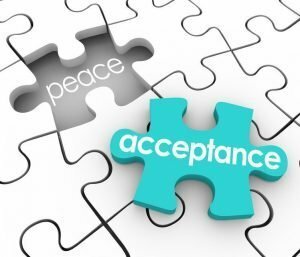 For the purpose of this post, the stages concerning acceptance and visualization will not be discussed, rather more understanding will be shed on these two important states. Sometimes wrongdoing at the hands of someone can lead to a life-altering event, such as broken homes, career loss, physical injuries or maybe even near-death experiences. These events can be so severe that at the very least they can cause a person to reevaluate his or her life. At worst, they can force a person into a permanent change of lifestyle. Acceptance of the experience and the resulting changes are important because the person who experienced the wrongdoing runs the risk of living in the past. When I explain to people what forgiveness means, I am sometimes accused of encouraging them to cut ties from people they truly care about. This is not my intent, however, if you have truly gone through the grieving process and reached a genuine place of acceptance, you might reach the conclusion that certain people in your life are toxic for you. “If you are going to be going to trade school or college, are you going to see any of these people there?” If you have reached a place of acceptance, you can not mix what you have determined to be toxic and what you have determined to be healthy and experience true happiness in your life. Acceptance is the process of coming to accept certain situations, people places and things for their nature and moving on with your life. The second and arguably the most important part of the process of forgiveness is visualization. The name speaks for itself, which is to visualize in your mind’s eye a situation you want for yourself, which you hopefully find happiness in. As the saying goes, you experience more of what you focus on. This means that with the closure you have gained from acceptance, you are now free to visualize and create the life you want for yourself. If you are focused on this endeavor, your feelings of confidence and joy should gradually grow, as you make steady progress towards your goals. In this state of mind, feelings of sorrow and bitterness are replaced with optimism and joy, as you work to do what’s best for you. Most people are familiar with the five stages of grief, but not with the four stages of visualization. These four states are identifying doubts, creating desires, acknowledging positive feelings and creating an action plan. In another post, I will go into detail on the four stages of visualization.